Kollywood fans must be waiting with bated breath as three big Tamil films will be releasing tomorrow. 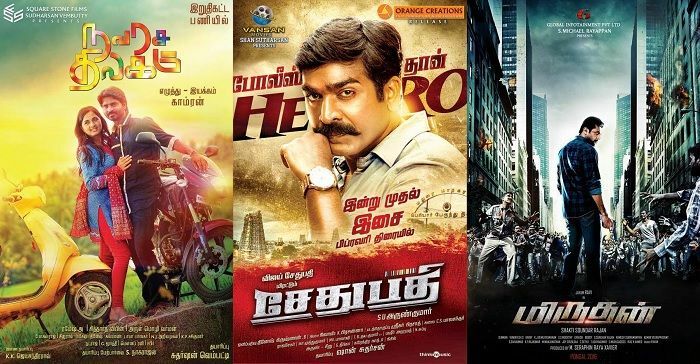 Miruthan, Sethupathi, and Navarasa Thilagam are all slated to release on 19 February. Directed by Shakti Soundar Rajan, Miruthan is Tamil cinema's first zombie-horror film. Miruthan stars Jayam Ravi and Lakshmi Menon in lead roles. The second release will be Sethupathi, an out and out action flick from SU Arun Kumar. Starring Vijay Sethupathi and Malayalam actress Remya Nambeeshan, this is Sethupathi's first attempt at a full-fledged action role and it remains to be seen whether the new avatar will find takers or not. The third release is Navarasa Thilagam which has been directed by Kamran and stars Ma Ka Pa Anand and Srushti Dange. According to Kamran, Navarasa Thilagam is a laugh-riot and at the same time, is a good family entertainer. Now it's up to movie lovers to decide on which film they will spend money and time on.